ADJUSTABLE BALL MOUNTS - Auto Wheel Services, Inc.
CURT ADJUSTABLE CHANNEL-STYLE MOUNT 2"
BUYERS PRODUCTS ADJUSTABLE TRI-BALL MOUNT 2"
CURT ADJUSTABLE TRI-BALL MOUNT 2"
ALUMINUM ADJUSTABLE BALL MOUNTS 2"
Fastway® Flash™ Adjustable Locking Ball Mounts give you lightning-quick adjustments, maximum theft protection and stunning good looks, The dual hitch balls make towing different trailers a snap and offer superior strength and hand-polished shine. Fastway® Flash™ E series ball mounts give you lightning-quick adjustments and stunning good looks. Each Flash ball mount is precision-machined in the Mountain West, making it stronger and longer lasting than other aluminum ball mounts. 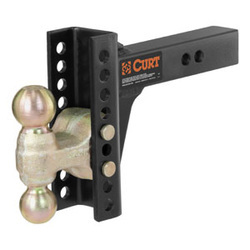 If you are looking for a strong, reliable and attractive pin-style ball mount, look no further. 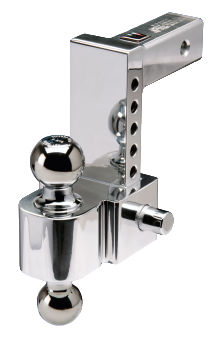 The Fastway Flash E series ball mount is superior in strength and craftsmanship, and its hand polished aluminum outshines the competition with a gorgeous, mirror finish. Shhhhh! You’ll never believe how quiet an adjustable ball mount can be until you use the Fastway® Flash™ Solid-Tow™ adjustable ball mount. It virtually eliminates hitch noise, using an internal mechanism to secure the shank in the receiver, and the hitch ball holder to the shank. Its sleek design and hand-polished aluminum will get your truck noticed, and its adjustable height and dual hitch ball make it an excellent choice for towing.